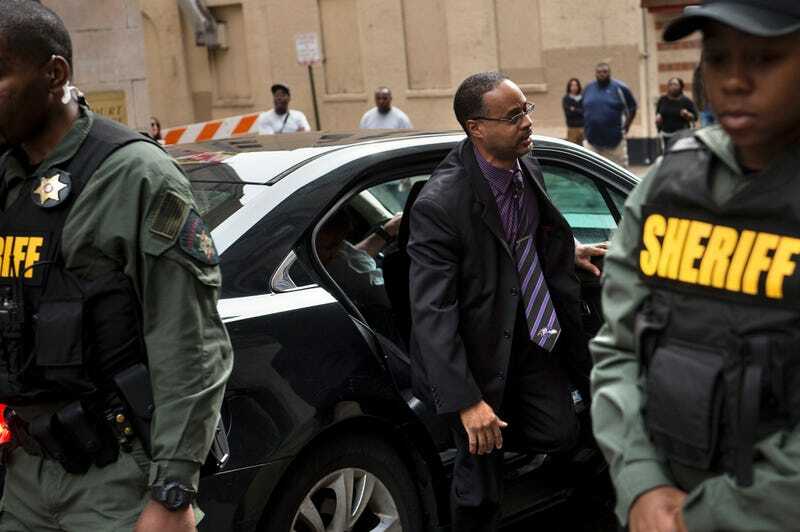 Baltimore Police Officer Caesar Goodson Jr. arrives for his murder trial in the death of Freddie Gray at the Baltimore Circuit Court House on June 23, 2016. Baltimore Police Officer Caesar Goodson Jr., who faced the most serious charge of all six officers indicted for the death of Freddie Gray in April 2015, was found not guilty by a judge Thursday, WBAL-TV reports. Goodson was the only officer charged with depraved-heart murder, a second-degree felony that carries a sentence of up to 30 years in prison. According to the station, the 46-year-old was also acquitted on all of the other charges he faced: three counts of manslaughter, second-degree assault, two counts of vehicular manslaughter, misconduct in office and reckless endangerment. Closing arguments in Goodson's trial, which lasted eight days, were presented Monday. The state had called 22 witnesses, while the defense called only nine witnesses during the trial, WBAL-TV notes. Fellow Officer Edward Nero, who was acquitted of his charges by the same judge in May, testified in the case on Goodson's behalf. According to the Baltimore Sun, Judge Barry Williams said that prosecutors’ theories about Gray having received a "rough ride" were not backed by sufficient evidence. "The court cannot simply let things speak for themselves," he said in his ruling. Williams said that "rough ride" was an "inflammatory term" that is "not to be taken lightly," and prosecutors did not prove their case. Prosecutors had accused Goodson of having five chances to render aid to Gray after he suffered his ultimately fatal neck injury in the back of the van, which they said demonstrated a "depraved heart." They also accused Goodson of being the direct cause of Gray's injuries, by driving the van recklessly so that Gray— shackled, but not restrained by a seat belt—was tossed about in the back of the van. Prosecutors said that Goodson knew Baltimore Police Department rules but broke them. Goodson's attorneys, however, argued that officers who checked on Gray did not know that he was seriously injured and that Goodson deferred to the other officers present, who decided not to properly secure Gray in the van, the Sun reports. Defense attorneys blamed Gray for his injury, saying that he had been put on his stomach in the van but stood up. Baltimore Mayor Stephanie Rawlings-Blake issued a statement shortly after the decision, announcing that Goodson would be facing an administrative review by the Police Department and urging citizens to remain patient until the entire process has been completed. "I am proud that we as a community have come together to move our city forward over the past year," she said. "I know the citizen of Baltimore will continue to respect the judicial process and the ruling of the court." Read more at WBAL-TV and the Baltimore Sun.